Most straight-A school leavers that manage to attain the much sought after “six points” for six subjects in their grade twelve statement of results look to the future with high flying intentions of studying the sciences and making a career in either medicine or engineering. Alina Mateke on the other hand has no such plans even when she got similar results early this year. The 17-year-old Livingstone resident has made up her mind that she wants to study art because that is where her heart is and she is happiest when she is creating art, and the best thing according to her is that her parents are supportive all the way. “I sat for English, maths, biology and science which is combined physics/chemistry I also did commerce and literature and never did art at school but I want to go and study graphic design and fine art. I wasn’t very sure of what career I wanted but my mother told me to study very hard so that I’m not forced in to a career that i don’t want after grade 12,” says Mateke. She never took art as a subject but only joined the art club at her school, St. Mary’s in Livingstone when she was in Grade 11. But she was too busy to continue in Grade 12 and stopped going there, instead always vising the art teacher in charge of the club for advice and he told her just to get ready and prepare for the exam. 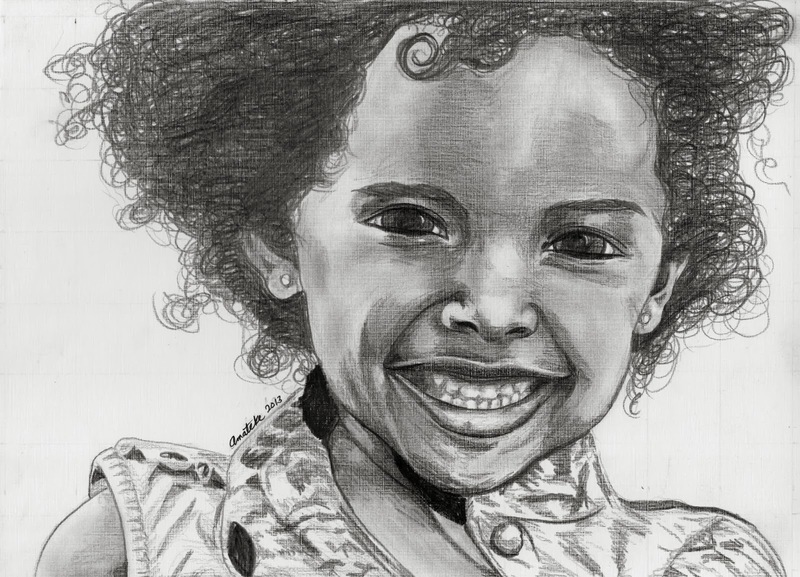 Looking at a few of her works, which are mostly portraits, without a doubt she does have an outstanding command of graphite pencil, charcoal and acrylic as media. If she does go to art school she will be able to throw in the other elements such as various composition techniques and broaden her scope of presentation as well as develop her own deeper artistic introspection. Already works such as In the Comfort of Young Love and My Inner Child – both graphite drawings -- by creativity of the titles and composition bring in two reaches of understanding, the analytic and the intuitive. Motherly Love, an acrylic on canvas painting – a close-up of a mother and infant giraffe -- even made it into the high-ranking 20th UNWTO general assembly main art exhibition that was held at the Livingstone Museum in August, making her the youngest in the show and one of only four female artists that included her mother a Claire Mateke mamologist by profession, Agnes Buya Yombwe and Mulenga Mulenga. “At first they (exhibition organisers) said they just want experienced artists so I didn’t bother to submit any work. But I was just passing through while going to have some of my work framed and then someone saw it and asked me to bring some for the exhibition,” she says. She enthusiastically explains how this was in fact the second exhibition she featured in, the first one being another group show she was informed about by her mother that was held at Safari Lodge in Victoria Falls town in Zimbabwe. It was called Women in Art; and included all-women participants from Zambia, Zimbabwe, Malawi and other surrounding countries. She did not sell anything during the exhibition in Zimbabwe but was inspired, meeting with other female artists who were more experienced than she is. “But I did sell one piece, before we took our work to Zimbabwe, because we did a mock exhibition for family friends, just in the living room and we put prices on the paintings and drawings. 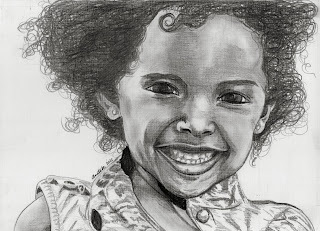 So one family friend bought a piece, I didn’t sell anything in Zimbabwe but I got a lot of responses and a lot of commissions, where people wanted me to draw portraits of their children,” she says. Sadly, of late she has not been producing as much as she used to because upon completing school last year she quickly went into teaching, inspired this time by her father Vimbi Mateke a teacher who was once the head of Linda High School in Livingstone but is now the District Education Standards Officer in the sweltering rural town of Gwembe. “I started teaching at Lubasi Hope Orphanage, I helped children in reading and maths, and it was just satisfying to see them improve. The work at the orphanage is what got me an assistant teachers place at Acacia International School where I have been since March,” she says. She says teaching Grade one and two classes can be very tiring, sapping one of all the energy to do anything creative when they get home, so she makes use of the school breaks to catch up on her art making. Mateke frets that the Zambian art scene is not that easy to follow and that there are not enough youths in art. “I have about five or six friends who are very good, even better than me maybe, but none of them have ever exhibited, mostly because they are very shy to show their work, so I think us young artists need some confidence building from the seniors,” she says. 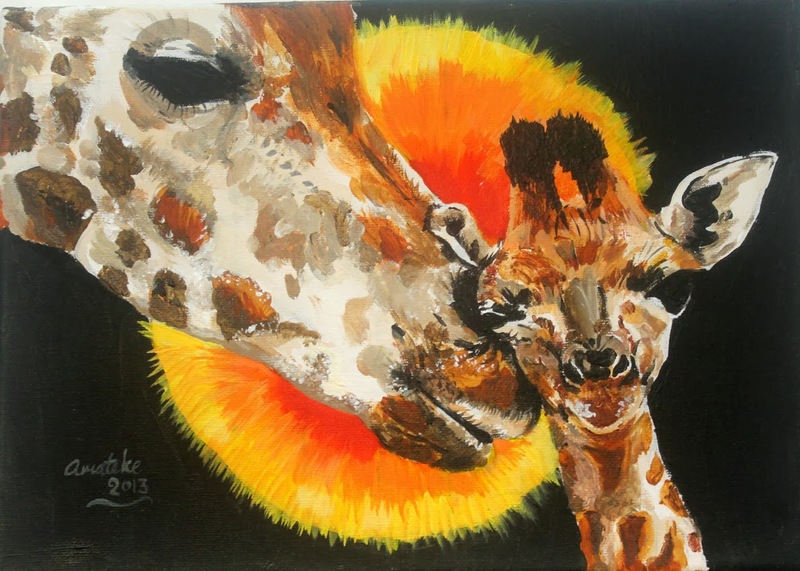 Because of this, Mateke is thinking of creating a Facebook page where young artists can upload images of their work so that they can gain confidence when their works receive the most “likes”, and after this maybe she can organize people to help with a real life exhibition. Mateke has two young brothers, a fifteen year old who is scientifically minded, but can also play the piano and his only attempt at art was making a drawing of an elephant’s intestines which she says he drew very well and a thirteen year old who has taught himself computer animation and web design from a book he borrowed at his school library. 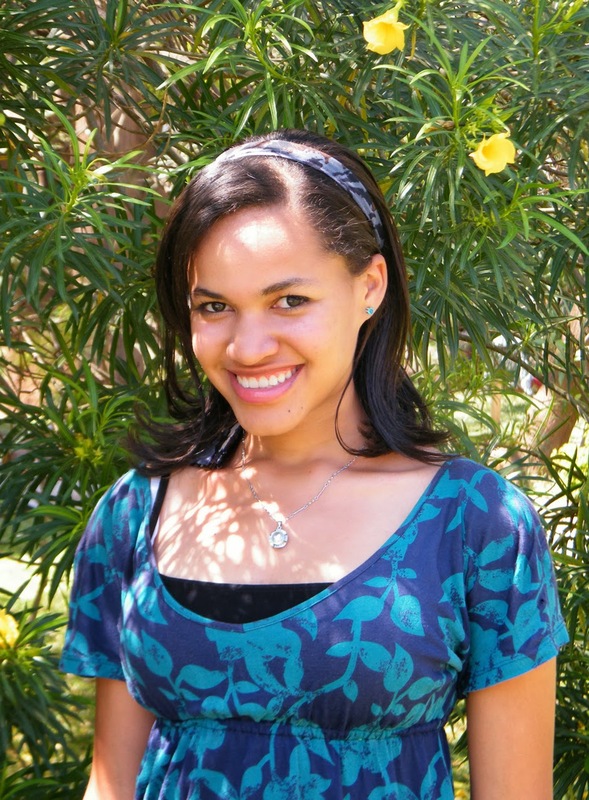 When she is not teaching, making art, surfing the internet, or listening to alternative rock and contemporary pop music – as most Disney generation teenagers do – she has discovered a new passion, writing. Her first article which is on conservation was published in Gill Staden’s weekly newspaper, The Livingstonian. Zambia is at a critical stage with regards the development of the arts partially because the creative economy is yet to be fully recognised and understood as a sector regardless of the extremely welcome realignment of the arts into a ministry it only shares with tourism. As such there is much hope and speculation that the impending National Arts Culture and Heritage Commission is the way forward in mapping out policy that will help enshrine the public and private support of the arts constitutionally, which will in turn see a better environment in terms of education, training and international exposure – by means of government-sponsored participation in international art fairs – for the artists. When one looks at individuals such as Mateke filled with youthful enthusiasm opting for a career in art instead of the sciences one just hopes the creative sector will be sorted out sooner for their sake. They are Zambia's future, the country will need artists that can compete on the international stage it will need art administrators, art lecturers, art historians and art critics, soon this very author will have to make way for young Mateke and her generation because obviously, she is just one of many. And with her grades she definitely has to enrol for a degree programme, but in Zambia, the only option is the Zambia Open University and for a degree in graphic design, her parents will have to look abroad. The Lusaka National Museum has introduced what is expected to be an exciting series of discussions, presentations and much needed progressive debates on contemporary art in Zambia. 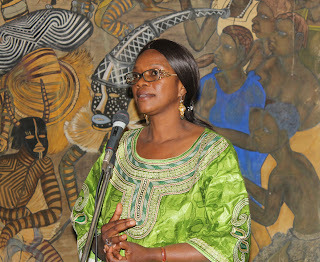 The Kundwe Art Talks as they are being called are organised by the Museum’s Education Department and coordinated every Wednesday by Emilia Alvarez a volunteer helping out with the documentation of artworks at the museum. 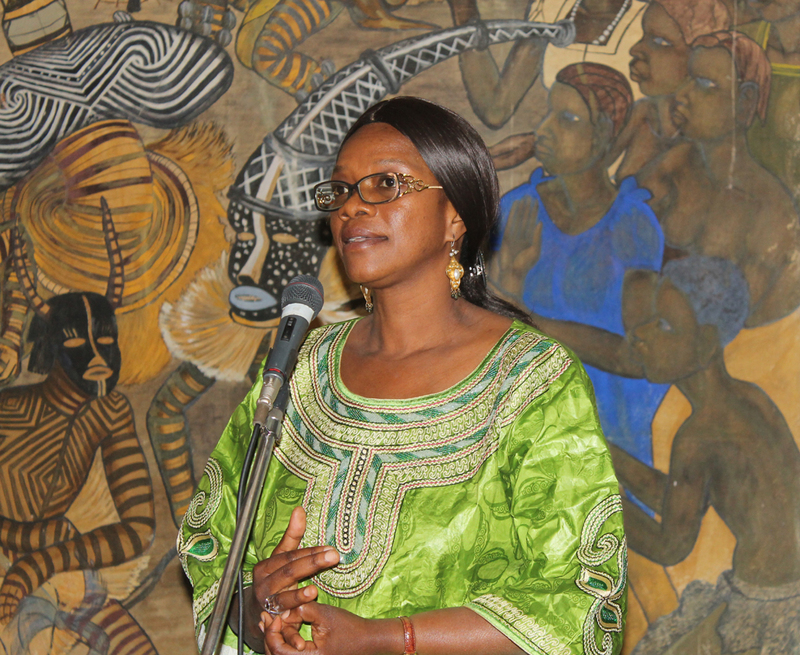 The inaugural talk last week was a presentation or a re-introduction rather, of the StART Foundation and 37d Art Gallery of Kabulonga in Lusaka by its curator Mika Marffy. Just under two years on the scene, The StART Foundation has emerged as an energetic new player that has already created ripples on the Zambian visual arts scene successfully combining creative charity work and commercial art sales, all the while encouraging creativity in children and supporting Zambian artists. “StART is structured on the twin basis of 37d gallery and Just Imagine workshops and programmes for disadvantaged children in Zambia. These two aspects exist upon a parallel, supporting and sustaining each other,” explained Marffy “Let me clarify by explaining these two component parts individually. 37d exists and operates for two purposes first and foremost to fund the Just Imagine projects. The artists that exhibit at the 37d gallery sign a contract in which they essentially agree to donate a thirty per cent commission of their income to the StART Foundation fund, this fee goes directly to fund the trust’s projects and activities”. She added that secondly, 37d provides established and emerging Zambian artists with yet another choice where they can exhibit thereby gaining access to new and different buyers; and that the gallery offers a professional alternative. The soft spoken yet eloquently charming Marffy spelled out that the gallery can only be visited by appointment because it was situated in a private home but this should not discourage anyone because the space was still very accessible through forums like the art talk, social media and the foundation’s website. Probably observing some irreconcilability, Zenzele Chulu, the Visual Arts Council Vice Chairman, asked whether there were any plans to separate the private premises from the core gallery business because there seemed to be a tug of war between them. But Marffy convincingly responded that buyers can purchase works online and there really was no need to visit the gallery. She also emphasised that the exhibition opening nights for select clientele – which one might add are very well organised – draw in serious buyers despite their exclusivity. “Our main focus is on the art workshops so we need serious buyers to come to the gallery and buy the artwork so we can keep them (workshops) going,” she said as she called upon Cilla Frost-d’Elbee, one of the StART Foundation’s founding trustees to make a contribution. 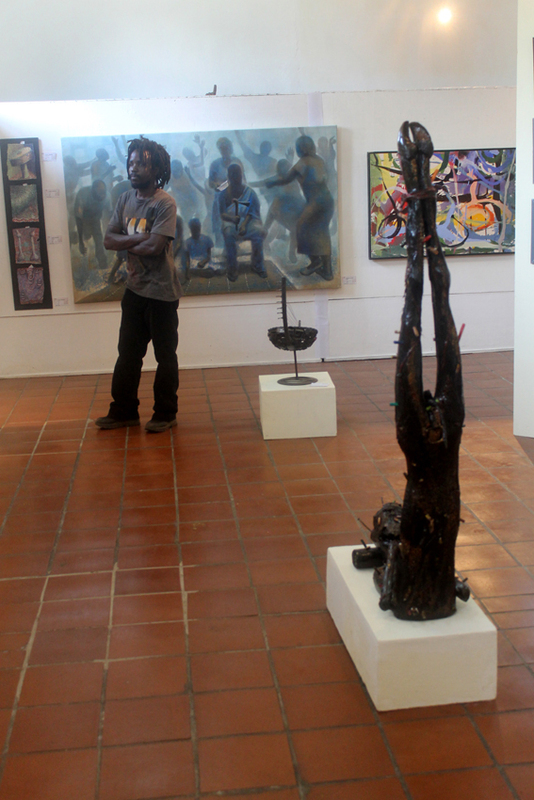 “We are a catalyst; we are not the only gallery in Lusaka or in Zambia. There are others, we are just adding our light to the sum of light and the way we have structured it is the way we like to run our trust so we think we are contributing to the whole and filling a niche but certainly there are many others and I think it is increasing all the time. The impression I am getting is that there is more and more interest in art,” said Frost-d’Elbee. Mwamba Mulangala chipped in and explained how he has been working with some street children for about 10 years and how now they are ripe enough to be affiliated to StART Foundation’s peer educator’s programme, taking over from what he has been doing with children on the Just Imagine projects. At this point, the author, who was also in the audience asked whether they (37d gallery and StART Foundation) did not fear the risk of reducing art to a commodity that will be enjoyed and purchased by a select few and echoed Chulu’s question on whether they had plans of bringing their exhibitions to a larger audience. This in turn swayed the talk into an ‘art-as-commodity’ debate, a running question which is in fact part of a global critical discourse. “We are trying to put Zambian art on the map, to be recognized as an entity on its own so we have to boost up the Zambian collector status. So to try and address that art being only a commodity for a select few people I fear that it could go that way but we try to invite as many people from the community as we can but mainly those who we know will buy” responded Marffy while again allowing Frost-d’Elbee to say something. “Art as a commodity? the same rules of art apply in Zambia as to the rest of the world, so in the rest of the world the serious collectors are a small group with lots of money. We have in the past liaised with the Lusaka National Museum over various options and it often runs into logistical problems on how to shift things from A to B. But we have tried to be very modern in terms of social media to blast those barriers”, Frost-d’Elbee. Anyway, Marffy explained that it was also a bit of a worry to move around works of art in case they get damaged. And the heavily dreadlocked, Rastafarian sculptor Nezias “Neziland” Nyirenda joined in to the “commodity debate” when he said artists have gotten carried away and made art for a certain group of people and as such it has become a commodity, he shared his experience of shifting from the Arts Academy Without Walls in the Lusaka showgrounds to Roots of Expression open air sculpture studio in the Chilenje area where he is not selling his work but allowing the community to watch him work. “We make art for a certain group, when we put it in the gallery it becomes a commodity because when it becomes too commercial it is like we are selling tomatoes because for you (StART Foundation and 37d Art Gallery) it sounds like when it sells you are satisfied, but the best art doesn’t sell”, suggested Nyirenda. But Marffy stood firm and maintained that through the money, although it might sound unsavoury to some, the end result is all about what art can do for the disadvantaged children. Again Frost-d’Elbee came in saying her foundation had only been around for less than two years but had made an impact as a catalyst in arts development and that StART Foundation had got people talking and debating and wanting to be in their exhibitions but as a foundation they did not own the way art is ran in Zambia. For sure Frost-d’Elbee was not implying that Mwaba built a house from a couple of 37d shows. The artist stunned the Zambian art scene when at the age of 32, he earned over KR100, 000 (K100million then) in a single show entitled Freedom in Translation at the Lusaka National Museum where he sold a painting High Priest for a record KR 18,000 (K18million then), which was unheard of for an artist his age in 2008. Nevertheless, the VAC Vice chairman Chulu made another contribution and asked if the foundation had any plans to break into the international market using the artists that are exhibiting at 37d and Frost-d’Elbee once again spoke up. “We were visited by a Tate Modern – Britain's national gallery of international modern art – scout last year. The recycled masks that came out of the children’s workshops was purchased by the biggest collector of African art in the world a man called Jean Pigozzi based in Geneva, so twelve of those masks went to Geneva. We had Read from the Read Gallery in Johannesburg come to the gallery, we have the website, twitter and the online gallery that we are still putting together,” she said. The Tate Modern scout she spoke of also visited the Henry Tayali gallery in the Lusaka show grounds but the itinerary of this shadowy figure was further obscured by his Zambian guides. And then Pigozzi, the European tycoon, is also known as a big-hearted philanthropist, one hopes he did not buy these masks as an act of charity and that he may return for work done a mainstream visual artist and not a disadvantaged child. Anyhow, an excited young artist who is affiliated to 37d gallery – and whose name will be spared – quickly interjected after this and likened art going to collectors especially those abroad to seed dispersal saying good things will germinate as their art was falling on fertile ground. “When it comes to 37d it should not even surprise us because they have chosen how they are going to play. I think ever since I came on the Zambian scene -- which is evidently not too long ago -- there hasn’t been so much noise made towards the art business,” he said. With a bit of research in his chosen field, he would have at least had an indication that artists never went wanting in the late 1960s through the 1970s which had avid private collectors such as liberation hero Simon Mwansa Kapwepwe and businessman Abe Galaun. We had the Barclays Bank and Anglo American Exhibitions and the Edward Shamwana-chaired Art Centre Foundation that would later inspire the Mpapa Gallery, the Minbank Collection, Gwenda Chongwe’s Zintu Gallery and the golden age of the Meridian BIAO Bank Collection when artists could not create enough to supply the demand. This was also at a time when Enzio Rossi, Andrew Sardanis and John Kapotwe were at their prime of collecting art. There is nothing new under the sun, as they say. “let’s give 37d so much work that they should fail to choose, so fear is the worst cancer we can have at this time,” continued the artist who seemed just a hair away from brown-nosing his new gallery, and who can blame him, after all he did earn himself something in excess of KR24, 700 – before the thirty per cent donation – in an upcoming artists exhibition at the gallery early this year. And he did not get out of the lucratively successful Lusaka My City exhibition walking away KR6, 600 richer recently. 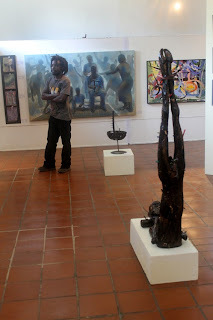 The Lusaka My City exhibition was a runaway success selling over KR100, 000 worth of art on the opening night alone with subsequent purchases and requests for work that is in the on-going exhibition that runs alongside the featured exhibition. It featured some of Zambia’s top artists as well as some upcoming artists. Themed around Lusaka’s Centenary celebrations it did far better than the Lusaka 100 exhibition held at Manda Hill which did not sell a single work despite the fact that it was brought “to the people” as it were, so exclusivity may have the commercial upper hand after all. Ignoring the nudging thought that they are trying too hard to be a posh outfit The StART Foundation and 37d Art Gallery with their unique model are truly a breath of fresh air on the art scene, and being a private entity of course they can run things their own way, but the Kundwe Art Talk at the museum brought ought a few interesting issues that are food for thought. As much as the concept of the online art gallery – nothing to do with 37d Art Gallery -- is working commercially abroad and in some cases locally true art lovers will never enjoy viewing a good collection or their favorite painter’s work from their mobile phone. Take for instance the reported coming of Jamaican Dancehall superstar Sean Paul to do a gig at the Levy Mwanawasa Stadium on October 23 in Ndola. Why are all his Zambian fans foaming at the mouth with unbridled excitement when they obviously have his music on their mobile phones, laptops and home theatres? It is because they want to listen to him live on stage. Similarly which Flinto Chandia fan would want to continue seeing tiny images of his latest sculptures on their smartphones when there is a possibility to see it up close, there is just something about seeing something live, the real thing? The Kundwe Art Talk’s also provided an opportunity for artists and other players to critically debate the discourse on art as a commodity. Dr Sidney Littlefield Kasfir an American scholar and art historian -- with whom the author made an acquaintance at the Arts Council of the African Studies Association in the US -- interestingly observes that when African artists get partially affiliated with high-end galleries, they often start producing parallel works, those for an elite market and cheaper spin offs for local collectors. In her book Contemporary African Art – Tames & Hudson 1999 – Dr Kasfir dedicates an entire 21-page chapter entitled Art and Commodity to the dialogue. She observes that there have been distinctions entangled in this belief, that between art and craft and a second between art and commodity. “Neither of these methods of categorization, which derive from European aesthetics and artisanal traditions, are, however an accurate reflection of African cultural realities”, writes Dr Kasfir. Popular local music is thriving today probably more than any other moment in the history of contemporary Zambian music and one cannot imagine how difficult it should be to compile a collection of it on to a single CD. Who do you include and who do you leave out? How do you select the songs, is it by period, presumed artistic merit or sheer popularity? Currently you have awfully popular Zambian by-products of hip-hop and Jamaican dancehall ruling the radio airwaves, pub and nightclub scenes, one cannot go anywhere without being confronted by the likes of the annoyingly infectious No More Love by Macky 2 Ft. K'millian or the equally contagious Go Mama Go by newcomer Karasa, tunes to which you will be caught singing along without realising. Artists are recording music at a prolifically dizzying pace that is hard to keep up with, the list is endless. You have newcomers such as Muzo aka Alfonso a rapper from Kasama who has sent shivers in the feud-driven ranks of the Zambian rap scene with his hard hitting, multisyllabic rhymes in old-world Bemba, which is beyond his years and borrows heavily from the proverbs and griot-type praise singers of Northern Province. Then there is the likes of the amoebic Danny – over the years his name has carried the suffix of his latest albums ‘Masiku Yonse’, ‘Kaya’, ‘Yakumbuyo’– that has inspired an entire generation of vocalists. There is also Cactus Agony, Petersen, Mozegator, Dalisoul, Slap Dee, Tommy D, Ruff Kid, B-Flow, B1, Alfa Romeo, Roberto, Shyman, Kay Figo, Judy Yo and the reigning queen of popular Zambian music herself Mampi. But as much as these are not easy to keep up with, contemporary Zambian music has a deep reservoir to draw from if we were to step back a few decades with the likes of Akim Simukonda, Paul Ngozi, Mike Nyoni, Patrick Chisembele, Joyce Nyirongo, Anna Mwale, Muriel Mwamba, Rikki Ililonga, Michael Kumwenda, Daddy Zemus, Laban Kalunga, Lazerous Tembo the legendary Nashil Pitchen Kazembe or the apotheotic Alick Nkhata giving us some of the country's most popular and at the same time influential music over the years. 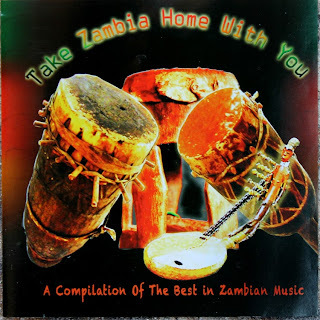 Paradoxically, none of these famous names, past and present made it on to the recently released UNWTO music compilation CD, “Take Zambia Home with You”, “A Compilation Of The Best In Zambian Music”. The CD was put together by the National Arts Council (NAC) as a small token that visiting delegates to the 20th general assembly could “take home” with them as the writing in the cover jacket suggests. 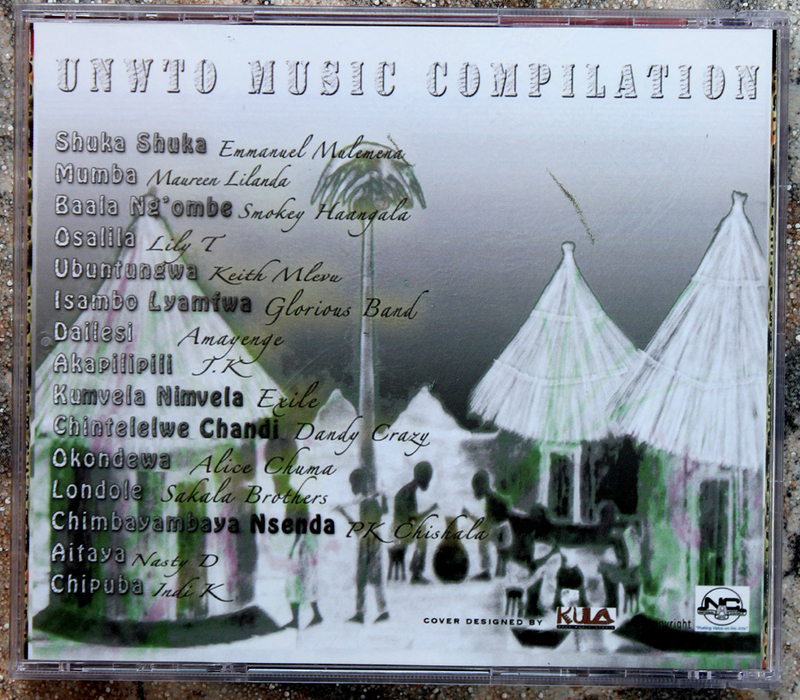 “This CD compilation comprises some of Zambia’s finest contemporary music. The theme, ‘Take Zambia Home with you’ was specially coined to convey a message of Zambian hospitality to the participants of the 20th UNWTO General Assembly, 24th to 29th August 2013. We hope each and every person will be able to enjoy Zambian culture and heritage by taking the best of Zambian music with them when they travel back to their homes,” reads the CD jacket text. The 15 track compilation only features Emmanuel Mulemena, Maureen Lilanda, Smokey Haangala, Lily T, Keith Mlevu, Glorious Band, Amayenge, JK, Exile, Dandy Crazy, Alice Chuma, Sakala Brothers, PK Chishala, Nasty D and Indie K in that particular sequence. These are without doubt some of the biggest names ever to grace the Zambian and to a certain extent international airwaves and the playlist makes a point of acknowledging pioneers such as Mulemena, Mlevu and Haangala while keeping an eye or ear rather on PK Chishala, Amayenge, the Sakala Brothers and the newer crop of artistes. However, the list is somewhat anaemic in that it is lacking in folk anthems, of which we have so many, some provided by bands such as Green Mamba, Mashombe Blue Jeans, Los Comrados, Masasu, Oliya, Serenje Kalindula Band, Kalambo Hit Parade, Black Power Band, Julizya or the Mulemena Boys. But again most of these are the kings of Kalindula, at their peak in the 1980s and it is not clear whether the CD was intended as a historic anthology of Zambian music, but judging from the hodgepodge of the selection one gets the feeling that it was. Again why NAC so easily makes its own decisions without occasionally consulting the general public is a question an arts writer, thankfully, does not have to speculate on. There was enough time to compile this CD, there was no harm in calling on the public to vote for their favourite songs from the 1970s through to 2013 while at the same time categorising the genres. There are a lot of brains out there including within NAC itself and a transparent voting system through either the national broadcaster Zambia National Broadcasting Corporation (ZNBC) or a telecommunication company could have been designed. Frankly, the list at hand looks like the playlist from a personal mobile phone or iPod. Sadly, for most of the artistes on the CD, the works that made it on the compilation are not even their greatest or indeed most popular works. Shuka Shuka is Mulemena’s offering. This is followed by Maureen Lilanda’s Mumba, Smokey Haangala’s Baala Ngombe, Osalila by Lily T, Isambo Lyamfwa by Glorious Band, Dailesi by Amayenge, Akapilipili by JK, Kumvela Nimvela by Exile (now known as Izreal), Chintelelwe Chandi by Dandy Crazy, Okondewa by Alice Chuma, Londole by Sakala Brothers, Chimbayambaya Nsenda by PK Chishala, Aitaya by Nasty D and Chipuba (chandi) by Indie K.
Those familiar with these tracks will notice that they are an assortment of love songs and moral essays, which is pretty much the main narrative of Zambian music, be it 1970s folk music and Zamrock, Kalindula of the 1980s and early 1990s, or the R&B-Hiphop- spiced sound of the late 1990s through to 2013. It is alright to have all this music on one CD, no matter how varied it is in style, but there is no missing the sonic thinness on a few of the songs, particularly the older music most of which needs to be re-mastered. The audible difference between songs such as Mulemena’s Shuka Shuka and Lilanda’s Mumba is unmistakable. As the graceful guitar lines of Shuka Shuka die down, Mumba comes on with the ear-splitting, thump of a baseline that it may not necessarily have but is exaggerated and made noticeable because the newer song is played after an old recording that has not been upgraded by sound experts in the studio. This continues as Mumba dies down for the older Baala Ng’ombe which is followed by again the newer Osalila subsequently creating an undulating audio pattern of lower to higher sound output. Not really the quality one would like to see a foreign visitor “take home” as a piece of Zambia. Speaking of foreign visitors, as much as the delegates to the UNWTO meeting were very busy and almost kept within the confines of the general assembly at all times, a few of them did venture into the city of Livingstone to sample its vibrant metropolitan nightlife which is easy to “bar hop” owing to the close proximity of the club scene circuit namely; Limpo’s, East Point, Pub & Grill, Masaka, Chez Ntemba and Fairmount Hotel. In all these pubs and clubs, the buttock-clenching tunes – or club bangers as they are called – No More Love by Macky 2 featuring K’millian, Go Mama Go by Karasa, Cry of a Woman by self-proclaimed king of Zambian dance hall music B Flow featuring Judy or Foolish Me by Chef 187 Ft. Mo$Money are the everyday anthems and without doubt any delegate – and there were quite a few – that found themselves on a night out surely had a go at dancing to these tracks. As such there would have been no harm in having them all on the CD because they are not essentially available in stores as some of the artistes have opted to sell their music from their car boots and backpacks; surely the adventurous delegates would no doubt bop their heads to these catchy pop tunes when they get back to Sri Lanka, Columbia, Spain or wherever it is they came from as they remember a night out on the town in Zambia’s tourist capital. In essence, a 15 track CD was insufficient. What NAC could have done was arrange a double CD or even a three disk gift pack with different genres of Zambian music, this was surely an opportunity, and it is not every day that government funds a music compilation. It appears just as we missed the opportunity of having an updated and comprehensive catalogue of Zambian visual arts for the UNWTO exhibition at the Livingstone museum, we missed the opportunity to have a comprehensive compilation of Zambian music probably ranging from the unbreakable Big Gold Six Band’s Msinje Wazaza to meteorically rising hip-hop group Zone Fam’s Translate. Of course here, one can argue that the most popular artists of today despite their bubble-gum character also deserved a chance to be on the CD even though they may appeal primarily to a younger demographic, and possess a sound that may not exactly be identified as Zambian. After all there is nothing authentically Zambian about Akapilipili by JK, Kumvela Nimvela by Exile or Chintelelwe Chandi by Dandy Crazy except for the languages in which they are sang. Still on popularity, some of the country’s most popular singers are gospel artistes. Even though a few may seem to be teetering along the thinning line between Christian music and secular music, the only difference often being the mere mention of Jesus Christ. You have well-liked acts such as hip-hop gospel artiste Mag 44, the eclectic Pompi and Kings with his DRC influenced, highly danceable brand of gospel that rivals secular Congolese singers Werasone and Fali Ipupa’s in its trouser-tearing ability. As to whether they garner their popularity from the fact that they too appear to have adopted the trendy African American influenced “bling” lifestyle popularised in R&B-hip-hop videos, characterized by fancy cars and flashy clothes, or indeed there is some salvation to be found in their lyrics, it is not clear but it remains a matter of fact that they are extremely popular, they sing to sold-out audiences, enjoy regular airplay and they are also favourites on long distance buses. But still, it appears no amount of popularity or artistic merit can land these recording artistes on to the UNWTO CD because their Christian themed lyrics, and regardless of whether Zambia is arguably the only self-proclaimed Christian nation on the planet, this is no licence to include religious music on a disk that will be handed out to delegates of varied cultures and belief systems. Anyway, some of the gospel artistes have collaborated with secular singers and musicians particularly on Chipolopolo football anthems. During the short period that Zambia reigned as African Soccer Champions, our airwaves received a barrage of new songs dedicated to the victorious Zambia National team and some of them do make quite good listening, there would have been no harm in tossing one on the CD. Besides, football is deep rooted in Zambia and how better to take a piece of the country home than a popular football song that has Zambia’s name chanted continuously in its lyrics. But in any case, maybe non-Zambians have a better ear at determining what can be classified as authentically Zambian than we do ourselves. Take the Zambia Roadside 1 and 2 series of CDs for instance, you can tell that a lot of work and research went into compiling a Tonga, Ila, Lozi, Leya, Aushi and Bemba CD. “Zambia's musical diversity and richness is indeed a true natural resource, but to this day it is still underestimated and relatively unknown. Michael Baird presents here upbeat rural recordings with deep dance grooves, marvellous drumming, an old xylophone master, exquisite vocal harmonising, uplifting gospel music Zambian-style, the ancient kalumbu bow - a mixture of youth and tradition!”, reads the text on Roadside 2, a CD put together by Michael Baird of Holland recently through the Dutch imprint Sharp Wood (SWP), the same label that compiled Zambush Vol. 1: Zambian Hits from the 80s, Zambush Vol. 2: Zambian Hits from the 60s and 70s which features The Big Gold Six, Emmanuel Mulemena, Nashil Pichen Kazembe and Bestin Mwanza. These CDs have very high audio quality despite most of the music having first been recorded in the post-colonial 1960s. These well compiled CDs would have been gems to give delegates to take home with them, but it is not clear what piece of us it is that we really wanted our guests to take home with them. But then, there is always a next time. 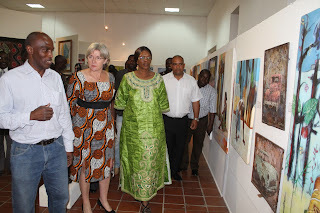 The main contemporary art exhibition that was held at the Livingstone Museum for the just ended UNWTO general assembly was regarded by many as representative of the cream of Zambian visual arts talent. 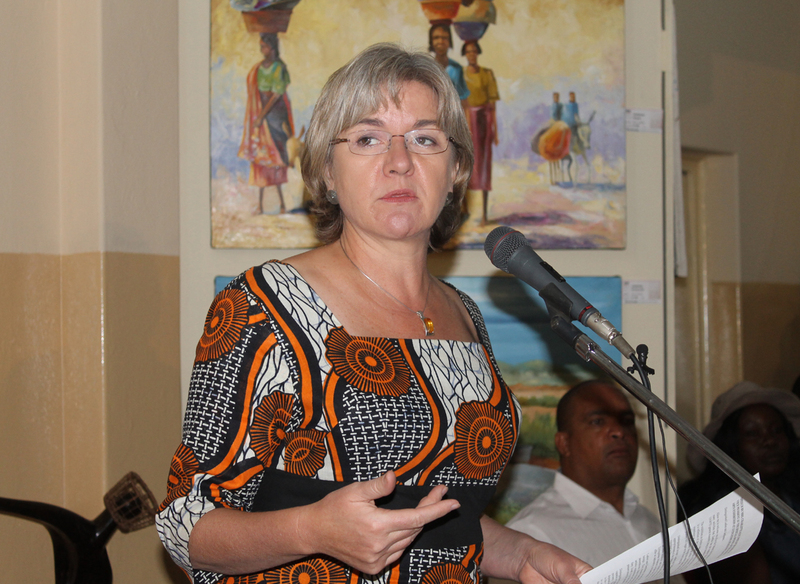 Officiating at the opening on August 23, the second lady, Dr Charlotte Scott, herself an enthusiastic follower of Zambian visual arts went to the harmless extent of safely speculating that it was an all-inclusive representation of Zambian artists declaring it was not “the usual suspects of Lusaka or of Livingstone”. As much as one would want to agree with her honour the second lady that the show did not have “the usual suspects”, it was in fact teeming with them. Almost at every turn there was a familiar name, names that you could almost speak in alphabetical order, even from the top of your head, which of course is not an issue if indeed their works represent the country’s finest. the exhibition at the Livingstone museum. 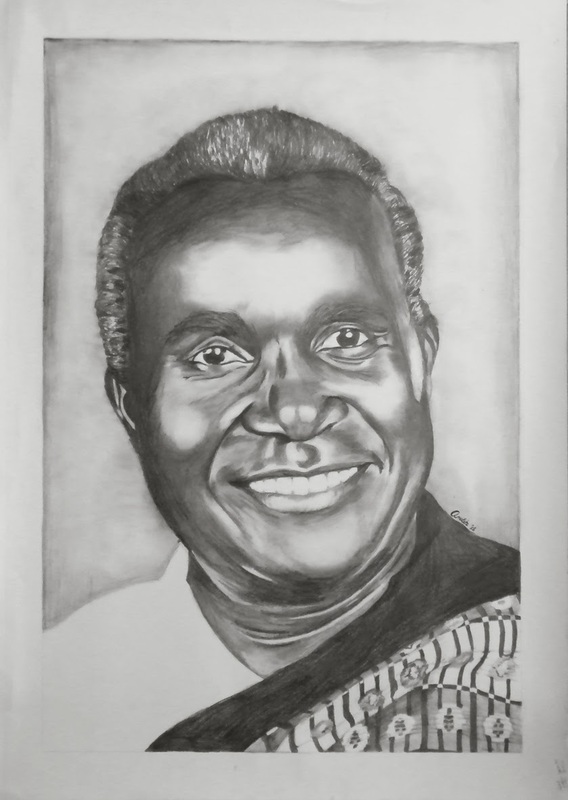 But what remains a lingering mystery is the selection of the so-called all inclusive works which only included four female Zambian artists namely Mulenga Mulenga, Agnes Buya Yombwe and the mother and daughter duo of Claire and Alina Mateke. Mulenga was the only one representing the rest of Zambia whereas Yombwe and the Matekes are Livingstone-based, meaning they may have only been included because they were “local”. Surely, it cannot be said that Zambia is short of female artists, whatever happened to Milumbe Haimba, Sylvia Mwando, Bridget Sakwana, Angela Kalunga, Caroline Miyoba, Agnes Lubumbashi, Tessie Lombe and young Gladys Kalichini who was in town for the Insaka International Artists Workshop? Anyway, the UNWTO show was not a women empowerment exhibition, but some will remember however, the dizzying number of female artists that crawled out of the woodworks during a Women’s Day exhibition at the Lusaka Museum in 2010, it tells you that they do exist and can be available if called upon. Still, it is not only the selection of works that remains a whodunit, but the panel of adjudicators if at all there was one was equally enigmatic and as difficult to place a finger on as a tiny blob of mercury. Neither anyone from the Visual Arts Council (VAC) executive nor its mother body the National Arts Council (NAC) was able to explain how the selection of works was made, who was sitting on the mediating panel or how the call to artists was made. But this is understood because they were all very busy, after all the whole world was understood to be in Livingstone. In any case, there is probably more openness in a papal conclave than there was in the selection of artists and works for what was meant to be one of the country’s most important art exhibitions ever. These are the kind of exhibitions that career artists mention in their portfolios for goodness sake. An exhibition of not only national, but to a certain extent international importance – if you would like to consider the UNWTO general assembly – with government funding that rarely happens. The exhibition also had what apparently was supposed to be an exhibition catalogue, a brilliant idea as far as ideas go. 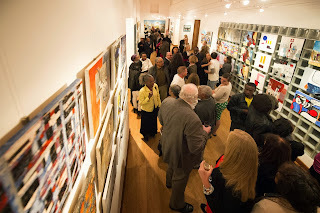 Anyone who has visited a well-organised exhibition will attest that a good catalogue provides viewers not only the opportunity to learn more about the theme of the show as well as the chance to learn more about the individual artists but even a chance to “take the exhibition home” with them, which again was in line with the UNWTO exhibitions theme “Take Zambia Home With You”. The exhibition catalogue in question, a well printed, glossy 22-page booklet should not have been printed at all. To start with, the publication tries to give what turns out to be a weak overview of Zambian Art and Culture, followed by misplaced biographies of Zambia’s five-or-so museums which were not necessary as the museums are still under the Ministry of Chiefs and Traditional Affairs which has nothing to do with the contemporary art exhibition. The booklet goes further to have a page titled Zambian Art at a Glance, which is perfectly okay if the text was not outdated owing to the fact that it reads like a paragraph from Gabrielle Ellison’s book Art In Zambia, revealing either a lack of time for research by the authors or indeed laziness. If the publication’s target were the international visitors, one has also to be very careful in suggesting that Zambia is “adequately represented in the diaspora with renowned artists”. It is a known fact that there is very scanty information on what so-called diaspora artists are up to, whether they are practicing art or not, what galleries are they affiliated to? Or do they market their own work. The international contemporary art scene is an extremely lucrative and therefore highly competitive and fast paced one, what is Zambia’s share into this market and who are her representatives, readers are not daft more so foreign ones. Are there any Zambian’s exhibiting alongside Chéri Samba from Congo, South Africa’s Johannes Phokela, Ghana’s El Anatsui or the British-Nigerian Yinka Shonibare to name just a handful of artists whom the west regards as African contemporary art superstars? Are there any Zambians selling with the London auction house Bonham’s or showing at the Tate Modern? As much as we may be proud of our brothers and sisters in the diaspora who go abroad on the grounds of academic study, we never hear of them graduating or continuing on their trajectory of pursuing greater heights in the arts, not that it is anyone’s business but their own. But the worst misdeed this booklet commits is that it only had about thirty of the exhibiting artists’ biographies, which is nearly half the number of the total group that had works on display. Once more all these biographies are outdated, starting from the profiles themselves to the artists’ mug shots, again they all look like they were clearly lifted from either Ellison’s book or one of the Lechwe Art Trust collection catalogues, sheer laziness on the part of the authors. One does not simply copy another’s work and assume no one will notice. Frankly speaking the small, nine-page catalogue for the on-going Graphic Art of Zambia exhibition in Choma is better arranged and its biographies too are freshly written and up to date, meaning whoever did it, took time to research. The UNWTO exhibition had newcomers we have never heard of such as 17-year-old Alina Mateke who was the youngest in the show, this was an opportunity for her likes to be introduced and launched onto the scene, seeing someone had already decided to put her in a major exhibition. This was an opportunity for us to have beautifully organised catalogue to serve as a historic reference book in Zambian art practice seeing we do not have any apart from the Ellison book and Lechwe catalogues, but we just had to throw away the opportunity did we not?. But overall one could sense serious inefficiency throughout the run of the exhibition. One morning, about two days after the opening, this author met an American couple who were very eager to buy two wood sculptures from the exhibition, the gallery attendants were in a muddle when the couple asked how much it would cost to ship the art to the US. Being polite, the couple excused themselves and said they will be back later in the day, just to give the gallery attendants a little time. 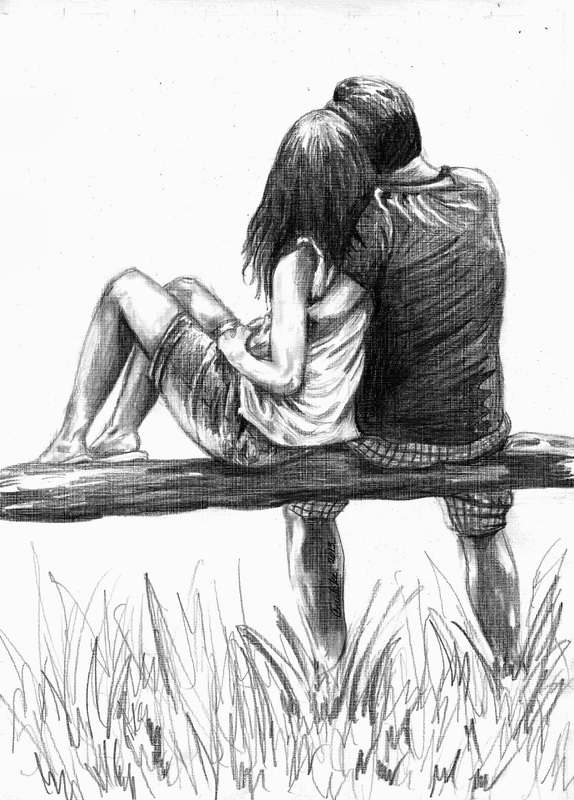 For sure, in the afternoon the couple returned but there was still no figure for shipment. When a quotation from a shipping company finally came through after a long series of phone calls between the gallery attendants and whoever was in charge of the exhibition itself, – most likely the VAC chairman who was busy at another venue at the time – the figure was so astronomical that the couple abandon the prospect all together and politely bade their farewells. Honestly, if you are going to sell sculptures, you must at least have an idea how you will ship them to your potential customer, this is basic commercial gallery etiquette. Speaking of sales, only one painting sold at the museum during the entire duration of the show, which is of no consequence, because exhibitions are not always about sales and any sober mind knew too well that delegates will not come and whisk away everything. But there were a lucky few that were able to sell when their works were taken to the UNWTO main conference marquee at the Royal Livingstone Hotel after an impromptu call from high office at the dead of night and the museum had to be opened so as the works could be transported there. Again another show of disorganisation. Was it not known that the main venue will have to be decorated too? Externally, the exhibition was a success simply because it did take place. But the undercurrents show that it was haphazardly done and lacked transparency and seriousness. Art is serious business and should not be taken lightly. If Zambian artists are to be taken seriously by their ministry or by the international art community they should start putting their act together, we cannot continue going in circles. Of course there are very few art professionals when it comes to arts management in the country, but a few do exist, and a few of them were trained at government expense and they can be found. The era of the know-it-all attitude and allowance-driven arts administration should come to an end. If those at the rudder of the visual arts are incapable of steering them in the right direction, they should stand down and allow those who are capable to take over. This is a field that is about to flourish and there is no time for games, not when there is talk of a National Arts Culture and Heritage Commission and an impending opening of the country’s first National Art Gallery which from the look of things we are not yet ready to manage. Arts minister, Sylvia Masebo has promised a total revolution in the way the arts are run in the country and that on top of the list, government intends to fully support the artists by first and foremost helping them to market their products. 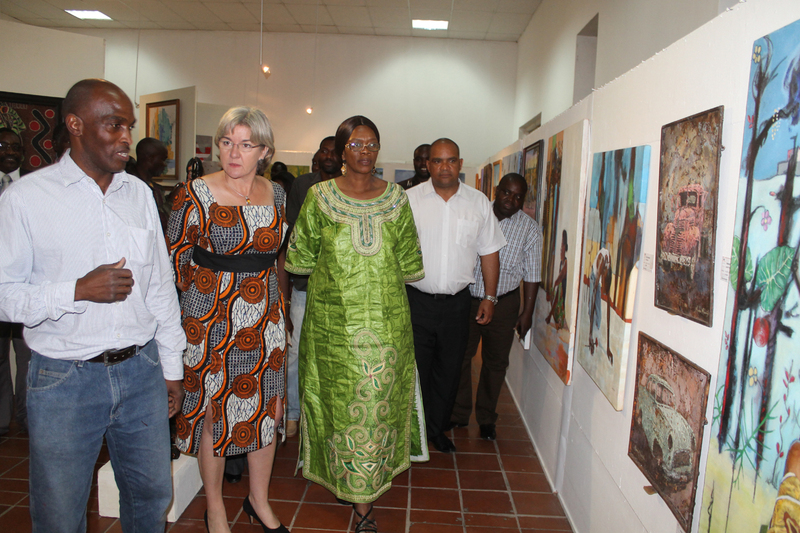 “I think that even you yourselves will be able to say that there are various steps that government has taken that show that this administration has attached great importance to the creative industry,” said Masebo officiating at the launch of Kamulanga, an on-going contemporary art exhibition by Zambian artists from various provinces held at the Livingstone National Museum, which was part of the arts and entertainment programme of the 20th UNWTO general assembly. Kamulanga is allegedly an all-inclusive exhibition that features works from three generations being beginners, to the mid-career and seasoned artists, a fact that pleased the guest of honour, the second lady Dr Charlotte Scott as was reflected in her official speech. Dr Scott, herself an enthusiastic follower of Zambian visual arts was pleased that it included artists from all over the country and it was not “the usual suspects of Lusaka or of Livingstone”, saying this it was a genuinely national collection and a reflection of lives and the people of the country, a reflection she thought in many cases mirrors the lives of the artists. “Going through the works on display here is very genuinely a journey through the country and I think those of you who are visiting Zambia should take time to walk around the exhibition with one of the artists or other people who can help you understand the many rich parts of Zambian life which you might pick up on the first glance because some of them have a very deep meaning,” she gestured. She said that she could not agree more with the appropriateness of the theme of the exhibition, Kamulanga, the Tonga word she loosely translated as “come and see”. She said she would like to make sure that this theme translates into what happens in the exhibition in the next few days and residents and visitors to Livingstone do come and see. “The arts play a very important role in our lives as human beings. They should not be viewed as pieces of or mere decorations, most of the things we know today about our own ancestors are due to the artistic expressions left on rock surfaces in caves or other dwelling places they lived in at the time, art is a very important method of historical preservation,” she said. The second lady, who was also matron for last year’s Amaka Arts Festival – and hosted a children’s’ art exhibition at government house – added that the arts are an important economic sector capable of generating the much needed jobs and wealth which will in turn help reduce poverty and that there were a number of countries in the world today who’s economies heavily depend on the creative industries including film, theatre, music and the visual arts, and that is why this Patriotic Front government was trying to do everything possible to reorganise the sector through the creation of the National Arts Culture and Heritage Commission. “We have also seen the realignment of the arts and culture sector into the ministry of tourism and the arts and I know through my own personal engagement how much and how long the artists waited for the ministry of the arts and how happy they were when it was created and I think this will help drive the process forward,” she said. Dr. Scott said hosting the UNWTO general assembly has given Zambia an opportunity to showcase various art projects to the entire world and that the country had also been given the impetus it needed to rehabilitate, redecorate, and spruce up not only the Livingstone Museum but also the Maramba Cultural Village and the Livingstone Art Gallery which will be the first purpose built national art gallery in Zambia when completed. She stressed that whilst the general assembly was a single event that will be finished within a week anyway, the benefits of having these infrastructure will be long lasting and she would like to think it is not just the infrastructure but the whole experience of having organised such an event will have lasting benefits. Dr Scott concluded her speech by congratulating the organisers as well as the exhibiting artists, she advised them not to wait for another international general assembly to set up such a show and that such exhibitions should be carried out more often. Read the full exhibition review of Kamulanga next week, only in your Saturday Post.